Sylvia Parker shares with VocationVillage.com about her career as a police officer. 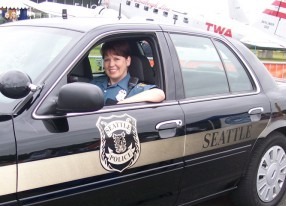 I’m employed in Seattle as a Police Officer with a Community Police Team. Each Officer in our unit works in an assigned area, usually much larger than the average patrol beat. We do not have to respond to non-emergency calls and can work on long term projects to find a long term solution to a chronic problem. Most often, we are able to work WITH the complainant(s), be that a single tenant or a community group, or possibly a group of businesses. We do stress that working together toward a solution is essential. We get to do some out-of-the-box thinking in finding those solutions, and it can be very rewarding to see the positive outcome. An example would be the opportunity to make an entire 20 block area in the city a safer and more pleasant place to live and work in by getting the stakeholders working together, setting up regular meetings with our CPT Unit, and following up on things like clean-ups, more lighting, block watches and list serves to alert each other. A lot of my time is taken up by paperwork and documenting progress, timelines, etc. Then there are the community meetings to attend. Probably the thing I like most is to just drive through my area and introduce myself to new business owners and new residents, chatting with the regulars and getting the ‘dirt’ on whatever problems have cropped up. I also have two schools on my list to go to and visit on a regular basis. One is an elementary school, the other a high school. I have to say that I just love yucking it up with the little kids! What does a typical day look like when you work as a Police Officer? There really is no typical day! The fact that I can come to work and know that today or tonight is not like the one before, or like any other day or night. I enjoy being mobile and not being confined to an office. I can be as proactive as I want, I can go where I want within my sector, and I am given a great deal of responsibility. I love dealing with people, even if it’s a difficult call. My favorite parts are the people interaction and sometimes actually being able to help someone. What are the most challenging things about being a Police Officer? Public perception, fed by the media. The lack of support in the general community. The fact that you almost expect to be punished for doing a good job. The constant risk and the side effects on your health due to stress, shift hours, and frustration. Being away from family. The lack of friends that are not in law enforcement. The thought of ending up in a shooting incident or some other fatal situation. I went on a few ridealongs once I knew that this was something I was interested in doing. Then I applied and took the civil service and physical fitness tests. Then came the background investigation and six months of police academy. What was your professional background before you launched a Police Officer career? What skills are most important to succeed as a Police Officer? Good people skills, especially being a good listener. Maturity and some life experience. Respect. Flexible thinking. Ability to take charge in difficult situations, to keep control of a situation and your own reactions to it, to keep a sense of humor and not let the job swallow you whole. What advice do you have for someone who wants a Police Officer career similar to yours? Don’t do it if it’s important for you to be liked. Most people you deal with will not like you for what you represent. In fact, some of those people might try to kill you without a second thought. If you can’t deal with that, become a fire fighter instead! Keep a life outside of the job and keep your sense of humor. Don’t let the negativity drag you down emotionally and spiritually. You will see the worst of people almost every single day. The times when you see good people doing good things will be very rare. Never forget that you might have to take a human life. Keep your respect for life despite everything. Be aware of the effects the job can and will have on you psychologically and physically. Shift work is difficult to handle, not just the hours, but also the effect on family/social life. Are there any commonly held misperceptions about being a Police Officer that you would like to clarify? I can’t even begin to answer that question here, but there is a great book I would like to recommend to anyone interested in law enforcement. It is called, “Stoning the Keepers at the Gate: Society’s Relationship with Law Enforcement,” by Dr. Lawrence N. Blum. What is the income range for Police Officers? Keep in mind that you can earn more through overtime and off duty work. The benefits are good and retirement income can be great. I’ve been both a Detective and in street patrol. The sheer paperwork and office time as a Detective are tough compared to street patrol. The wonderful thing about patrol is that you are *done* at the end of the shift and you don’t have to deal with the drawn out process of working cases like you do as a Detective. My attention span is just long enough to appreciate the opportunity CPT work gives me to enjoy the short term as well as the longer lasting interactions, while still interacting with lots of folks outside of an office on a daily basis. I am working on doing more forensics work and I hope to get into the CSI Unit eventually. I am now also a Certified Forensic Composite Artist and I have done sketches for this department as well as other agencies. I went to the FBI Academy in Quantico in 2009 for a three week course in Forensic Facial Imaging and in 2010 I studied 2D & 3D facial reconstruction from remains. I feel very blessed to enjoy my job as much as I do. I love the people I work with and we are able to have fun while getting our work done. The things I have seen and done on patrol have given me a window on the world that most people will never see. While that can definitely be a damaging thing, it is also my source for empathy, compassion, gratitude and the drive to help out others. Thank you for sharing your career with us!